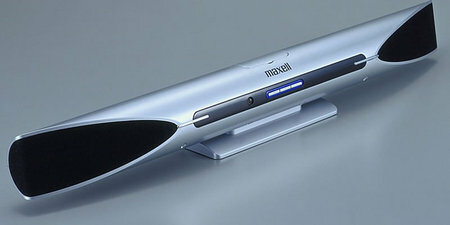 Shaped like a long tube the MXSP-1000 speaker and iPod dock from Maxell Japan is one of the coolest we have come across. It features a dock connector for iPodsand a 3.5 mm stereo connector for connecting other audio devices. The speaker unit is made from aluminium and has and delivers an output of 4.8w x 2 ch. A remote control is also provided for performing basic operations like volume control, play, track change, etc. The unit can also be hooked on to a wall using the provided stand. The measures 600×50×50mm and weighs 810 grams, it will be available in Japan from November 25 in three color choices silver black and white for 10,000 Yen ($ 85).